The Mission of the World Chelonian Trust (WCT) is to promote the conservation and assure the survival of all tortoises and freshwater turtles. We will do this by actively supporting in-situ conservation efforts, field research and veterinary research. In addition to this we will provide information and guidance to individuals and organizations to further the successful maintenance and propagation of captive populations. We firmly believe that only by supporting both wild populations and captive propagation can we provide the maximum options for the survival of all Chelonian species. 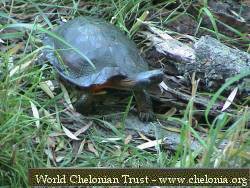 Members of World Chelonian Trust will receive the quarterly newsletter, access to detailed husbandry information and the opportunity to have an impact in world Chelonian survival. In addition to this we intend to offer our members the opportunity to participate in field trips, seminars and workshops. The generous support from members enables us to further impact the future of Chelonians far beyond what any individual can accomplish. We are actively pursuing partnerships with herpetological societies and turtle organizations across the Globe, offering our expertise and support in the ongoing effort to protect and succor Chelonians. We will continue to forge alliances in the area of turtle and tortoise rehabilitation; actively seeking qualified groups and individuals in the interest of joint effort. The WCT intends to work with these people as a networking facilitator, knowledge resource, and, in some circumstances, sponsor. In the area of education we will offer our experience and materials to further the care of Chelonia in captivity and the preservation of wild populations in all aspects. We see a bright future of cooperation ahead and wish to encourage contacts from all interested parties.